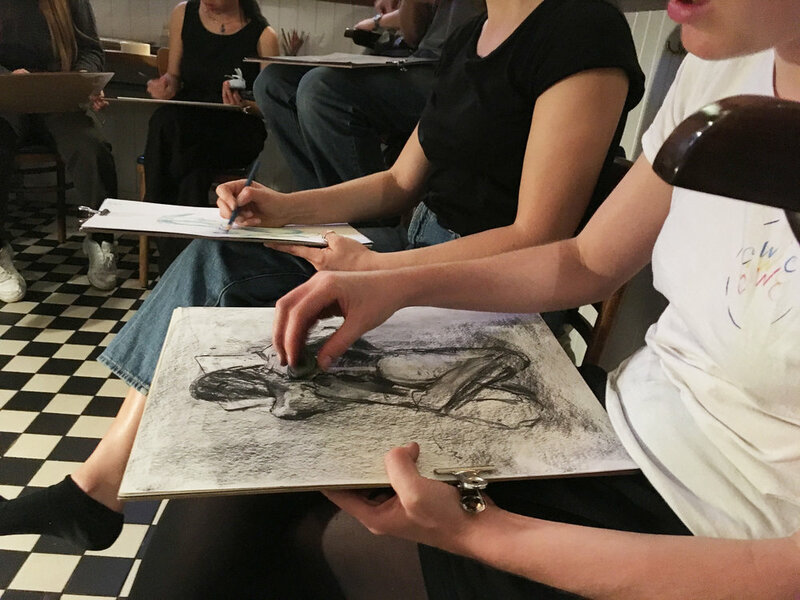 I am very excited to announce that I will be starting a new Life Drawing course at the beautiful Hara cafe on Sundays from 27th Jan to 24th Feb. It is a 5 week course and will take place from 7pm - 9.30pm. On this course you will have the chance to experiment with lots of different mediums and ways of mark making. 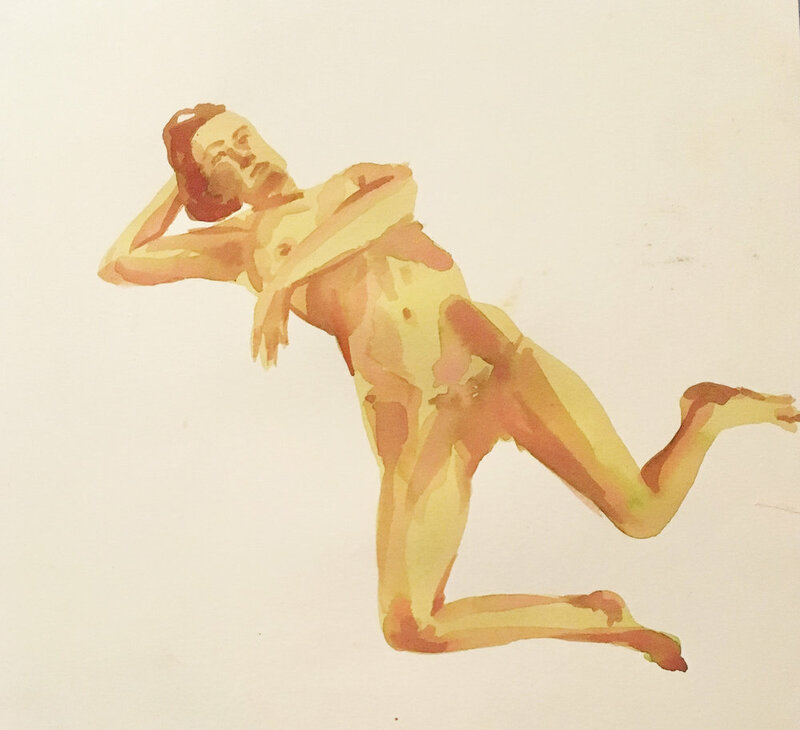 We will explore all kinds of ways of seeing and explore different themes in relation to the human form. 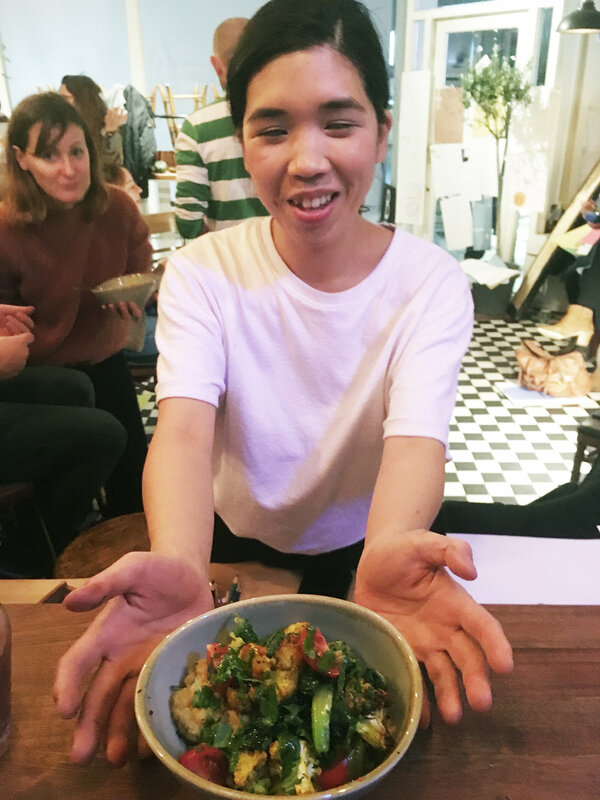 I will also be cooking a nourishing and tasty vegan supper each week which is included in the price. Fresh juices, home-made kombucha, tea & coffee will be available and you can bring your own wine. As always materials and food are included. 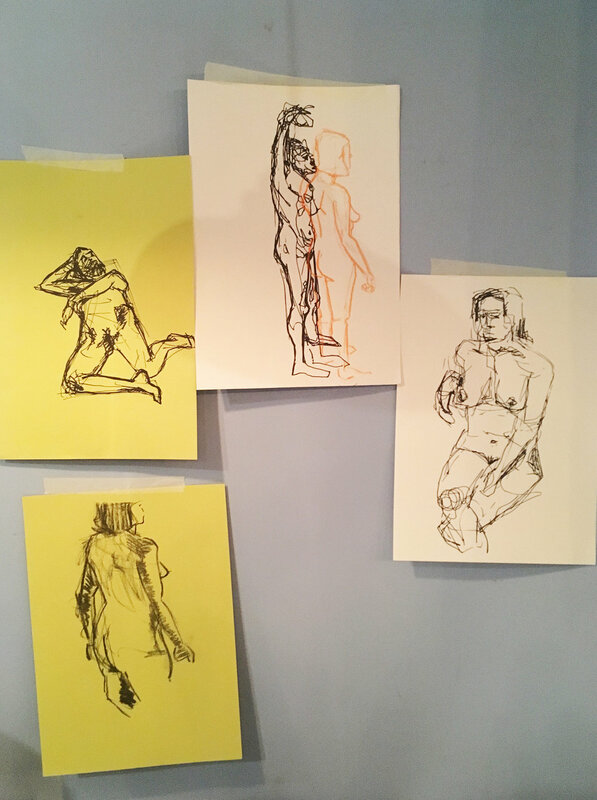 Life Drawing at Bernsteins 20/11/18 Body and Gender. 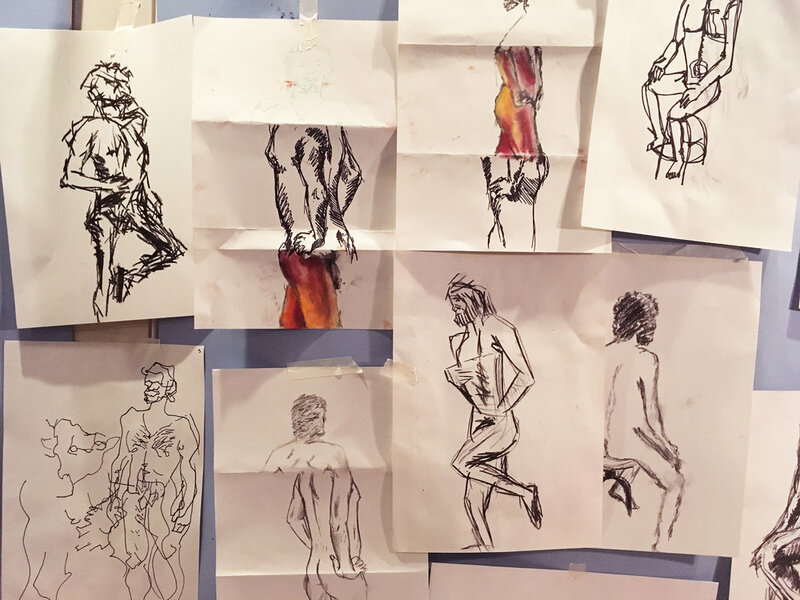 A class exploring gender through drawing poses which embodied and contradicted gender signifiers. This week we looked at societies ideas about gender, body hair, make up and posture. The art work made was fantastic as was the company. For supper we had a roast squash and carrot soup with fresh Aarrat Bread. A big thank you to everyone who came along as well as to Joy for modelling. A fun evening of drawing games, paint, charcoal and Vegan pie. Thanks to the lovely bunch who came along and to Kunal for being a fantastic model. Thanks to all the very brave people and our VIP Zombie model for coming along this week for a spooky draw and some lentil and pumpkin soup. We wrecked paper, drew with sticks and paint, listened to a lot of David Lynch and everyone made some really awesome scary work. 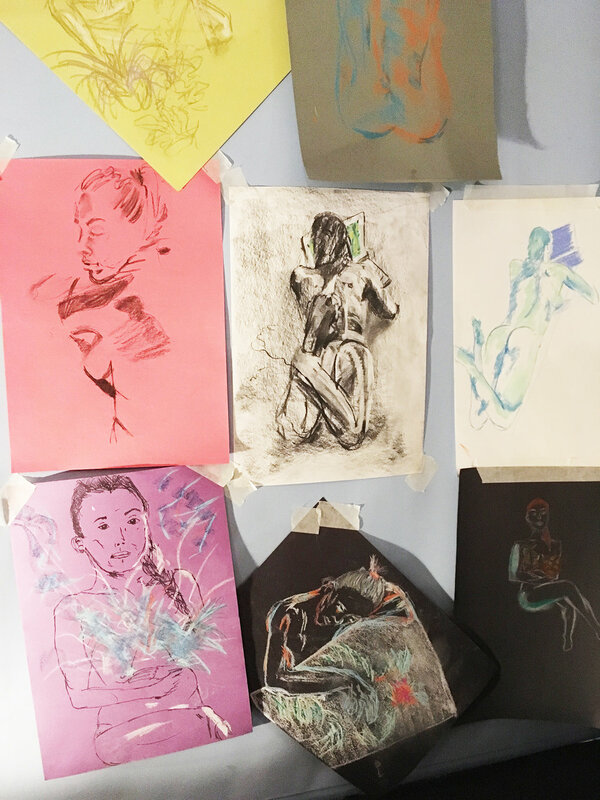 We explored how we can tell a story visually, looking at how our bodies are always quietly telling our own stories. The emotions we cary in expression, action and posture. We drew sequenced poses to make own own visual narratives. We drew waking up, drinking water and responded to Kate Tempest’s poem Hold Your Own. We munched a yummy squash soup topped with ginger, garlic and parsley pesto and fresh chilli. Here are some pictures of the beautiful pictures you made. A really special thank you to our model. Here is a video of Kate Tempest performing her amazing poem Hold Your Own. This week we looked in depth at ways of drawing and noticing shadow and light as well as how to draw in perspective. 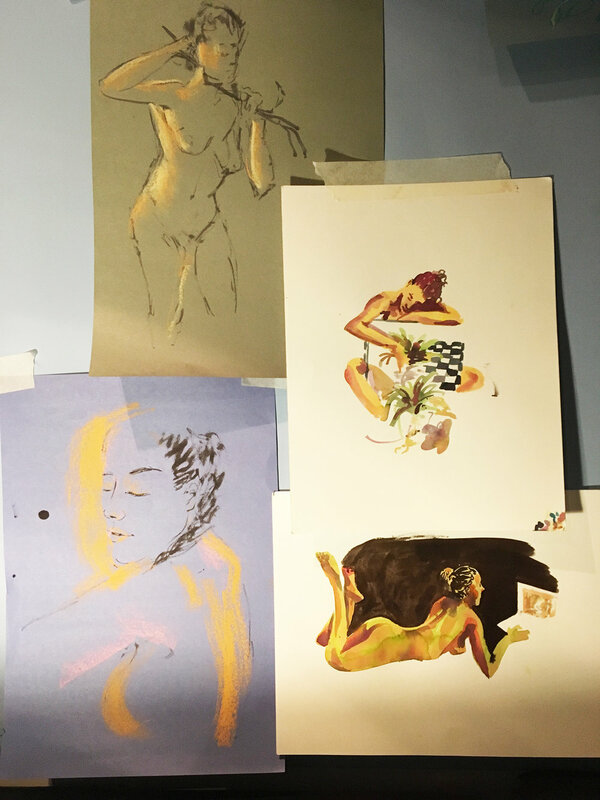 Here are some of the beautiful drawings people made. This week we explored the human body and clothes, how we use clothes to hide, to show off, to feel confident and also explored how clothing is attributed to certain genders. 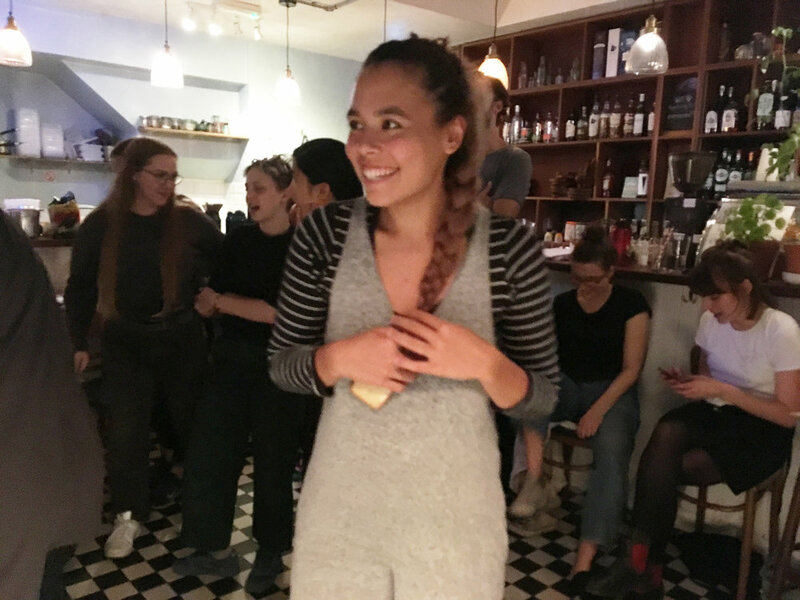 Thank you so much to everyone who came along. Our meal was, roast beetroot & parsnip with leek and green herb rice. Topped with beetroot humous, turmeric humous & fresh mint. Blend together half a bunch of parsley, half a bunch of mint, half a bunch of coriander or any other green herb, 1 clove of raw garlic, a good glug of olive oil. Cook rice and then stir in the herb mix. Top meal with sumac and fresh mint. 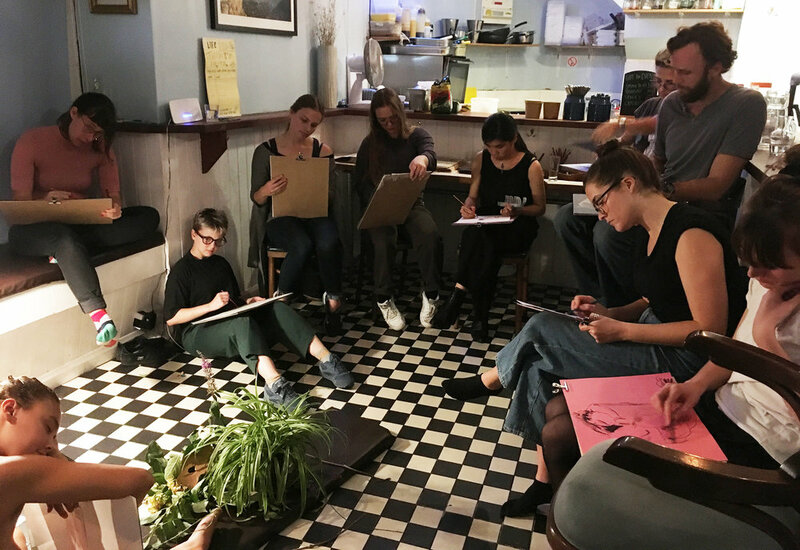 Thanks to everyone who came along to my life drawing class this week. This week we explored how we see ourselves, how we are seen and how we see through a series of drawing games and exercises. We also drank some wine and munched some vegan curry with roast cauliflower and roti’s. Here are some pics from our lovely evening. A special thank you to our model Tamsin. A really fun class drawing life in collage, experimenting with different ways of drawing texture as well as playing around with drawing on to different textures. We ate some yummy squash soup with naan bread, sipped wine and everyone made some fab artwork. A special thank you to our lovely model Tess. An evening of exploring our physical relationship with nature, our reliance on it, harmony with it and destruction of it and ultimately us as a part of it. Here are some lovely shots from the evening.